One of the great things about Facebook is when someone raves about a recipe they’ve recently tried and loved. This happened last week with one of my friends who tried mashed cauliflower. I reached out to her and she gave me the link. Since I don’t have much experience with cauliflower or how to use it creatively, this seemed like a great, simple recipe to try. 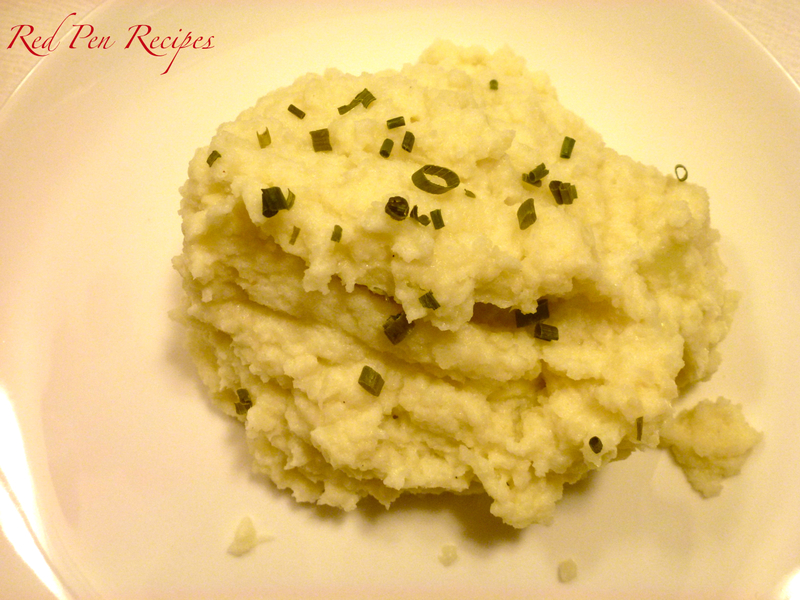 I thought using cauliflower instead of potatoes wouldn’t be able to compare to mashed potatoes. I was wrong. Not only did boiling the cauliflower take a lot less time to boil than potatoes would, but the entire recipe took less than 15 minutes. Just make sure you get the cauliflower as dry as possible after taking it out of the boiling water. My friend said she put the cauliflower in a tea towel and wrung it out. This is a great addition to any meal where you’re short on time. In a bowl with an immersion blender, or in a food processor, puree the hot cauliflower with the cream cheese, Parmesan, garlic, chicken base, sour cream, and pepper until almost smooth. Garnish with chives, and serve.